I'll probably be banned from Japan if this blogpost reaches their radiation-splashed shores. For the first stop motion video of my Cheap$kate Sushi Recipe Series I prepare Sushi Rice made with regular inexpensive rice - not official short-grain "sushi rice." 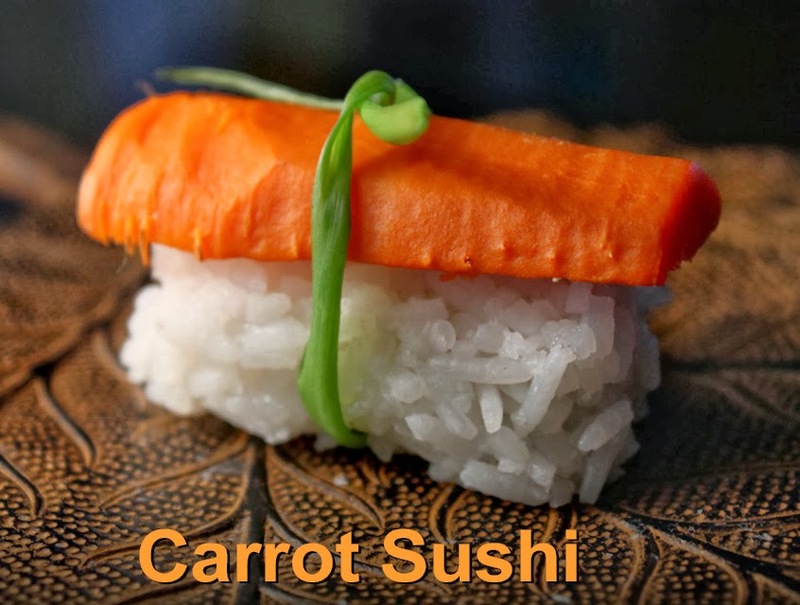 And upcoming outre entrees include: wine steamed Carrot Sushi; Portabella Mushroom Nigiri Sushi topped with chopped scallions; plus a fake-crab California Roll. I think that's enough right there to to cause any master sushi chef who watches my videos to commit hara-kiri. 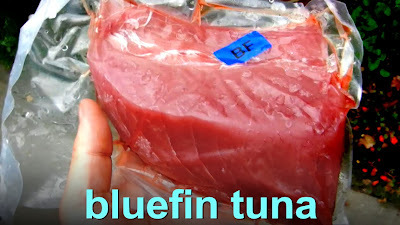 But I do use real locally caught fresh tuna for my upcoming video recipes of Tuna Nigiri Sushi and Spicy Tuna Handroll. And the only reason I can justify these expensive fresh fish recipes is because of the generosity of my deep sea fishing neighbor, Don. As you saw on the video post from a couple weeks ago (click here,) once or twice a year he goes out on a group fishing expedition and brings back a couple ice coolers filled with fresh caught yellowtail and bluefin tuna steaks. He likes to eat it fresh and can't store all of it....so, a few choice neighbors (me included) get a few pounds of the most delicious fresh sushi grade fish filets -- for free! Well, I manage once again to make you a slew of recipes for little or no money. Now I realize some of you are landlocked, and everyone is not well-connected for fresh fish. So I include a couple of cheap$kate sushi recipes anyone can afford, using inexpensive fake crab for a California Roll, a Spicy Krab Roll, and some nigiri-style Veggie Sushi using inexpensive veggies like carrots, and sometimes-on-sale portabella mushrooms. So make sure to check back because I have a fish tank full of delicious cheap$kate sushi recipes for you. For sushi you must start with Sushi Rice. Here's my rap on using cheap rice. For rice it just needs to be seasoned right and sticky. I guess sushi masters can tell the difference between regular long-grains of rice and short-grained sushi rice. 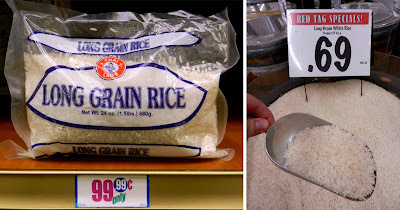 It's said that American long grain rice doesn't get sticky like short-grain Japanese rice -- that's BS, because I've done it many times and look how it sticks to my hand! And the grains do not turn to mush, as so many experts opine. 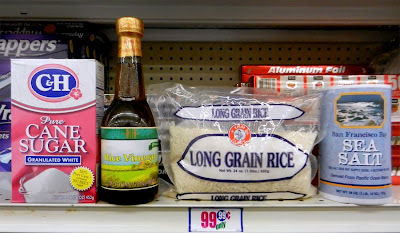 Any rice you find on sale will work for my cheap$kate recipe. I get mine for 69 cents to 99.99 cents per pound at Latin markets and my local 99c only Store. Sushi Rice is first rinsed 3 to 4 times. 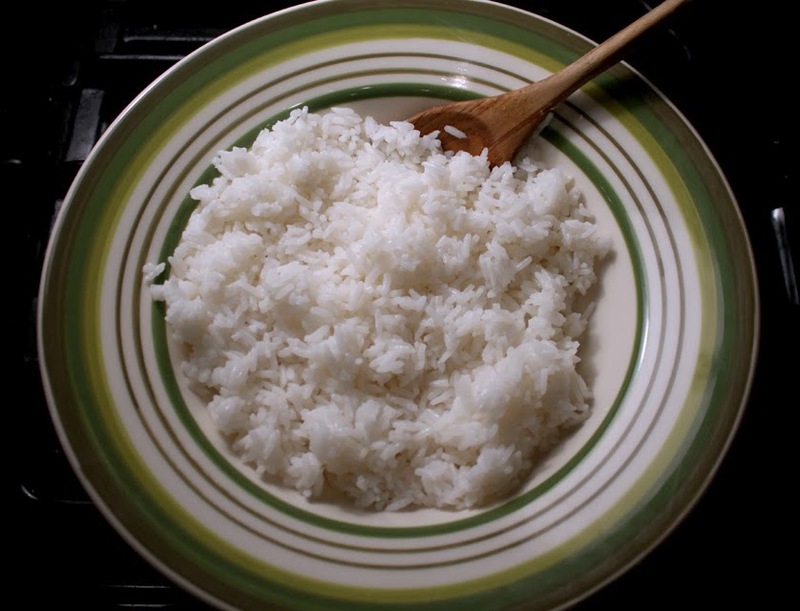 For steaming, the water to rice ratio is 1:1, that is, 1 cup of rice is cooked in one cup of water. 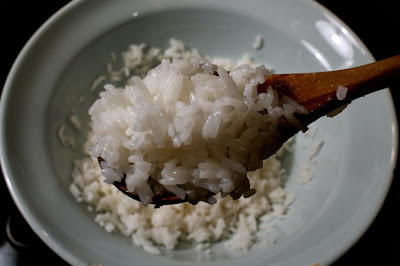 Sushi Rice is slightly sweet and tart with the addition of rice vinegar and sugar. If you don't have rice vinegar, use apple cider vinegar -- it's milder than white vinegar. A little salt is also added. For Sushi Rice it's all about the timing, just low-steam for 15 minutes; keep covered 15 minutes more with the heat turned off. Remove rice, but make sure not to loosen any dried-out rice that's stuck to the bottom of the pot; this will later cause your formed rice ovals to crumble apart. Finally mix in vinegar, sugar and salt; let rest a few minutes more, then get to making some sushi. 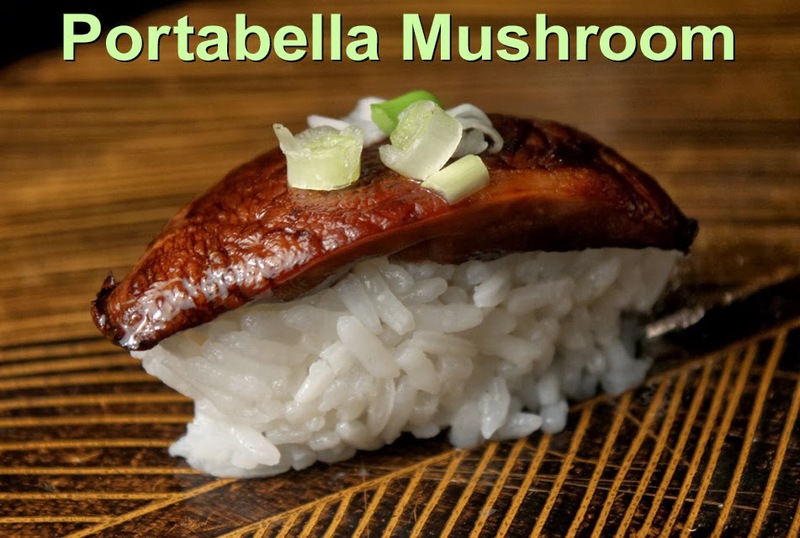 You will use my Sushi Rice for traditional Nigiri Tuna Sushi, which is just a ping pong ball-sized oval of rice that you top with a slice of raw tuna. For my next video you will get easy-to-follow steps using dried seaweed to make a Spicy Tuna Hand Roll, probably the simplest sushi recipe for beginners to make. And coming later is a recipe for a cheap$kate Krab California Roll with creamy avocado and crunchy cucumber. Play it here, video runs 3 minutes, 48 seconds. 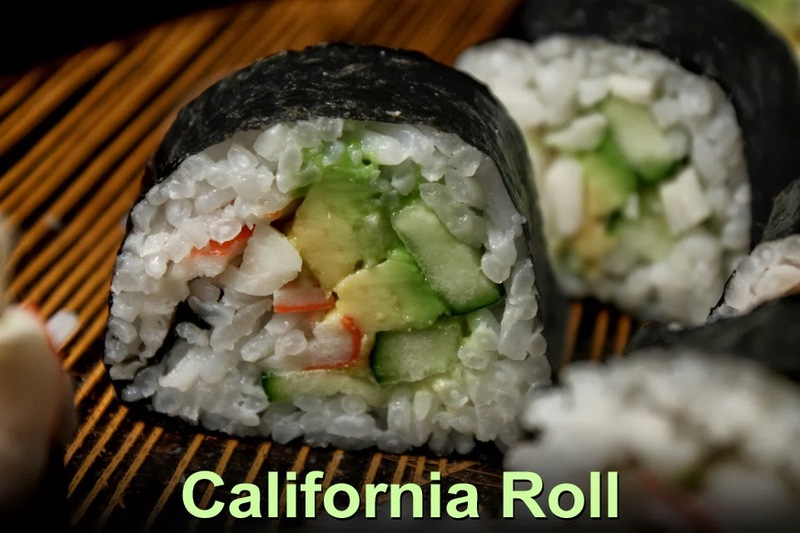 To view Sushi Rice Video on YouTube, click here. 1 tablespoon rice vinegar - or apple cider vinegar. Water to rinse rice -- about 6 cups. Put 1 cup of rice in a bowl that will hold at least 2 cups of water. Fill bowl and stir rice until water is cloudy. Dump water (not rice) and refill. Repeat 3 or 4 times until water is almost clear. Add rice to a pot with a cover and add 1 cup of water. Bring to a boil, reduce heat to low and cover pot. 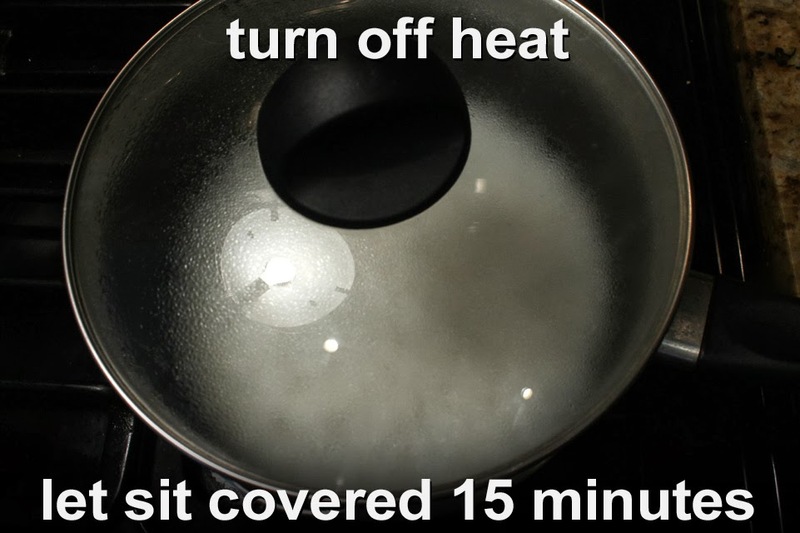 Simmer water with rice 15 minutes. Turn off heat, give the rice a quick stir (to release any stuck to the pot bottom,) and let sit for 15 more minutes. covered. After rice has set for 15 minutes add it to a glass or ceramic bowl. Make sure not to add any dried out rice that is stuck to the bottom of the pot. This will be a problem later - when you form the rice ovals, they may break apart. Cover and let it rest another 15 minutes. Sushi Rice is used at room temperature -- not hot or cold. Keep rice covered with a cloth (or lid) so it doesn't dry out, until ready to use. 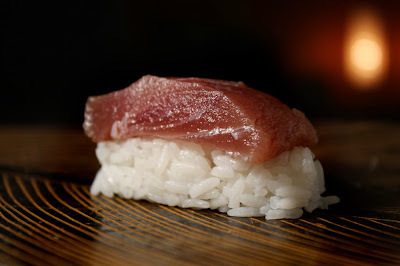 For Nigiri sushi (sushi and rice,) best to use fresh made sushi rice, it's more sticky and holds together best. For cooking the rice, a rice cooker is best, but since I don't own one, I resort to regular stove top cooking. It works fine. For brown rice do the same, except: add another 5 minutes to cooking time, and another 10 minutes of setting covered, when done. Brown rice is more chewy, but I like the extra nutty flavor. Plus it's more nutritious. I appreciate your criativity adn will try some of those. Myself i love sushi, since i tried it first time at a proper restaurant i loved it, so i recreated at home with great success, problem is that its not as cheap as it could be. Great blog you have. Am not very willing to try with regular rice but i probably will and ill do experiments at home such try with apple vinegar. Also i carefully manage the salmon and sometimes i do not put avocado, only cucumber which is extra cheap. I also always do small rolls using a sheet of nori to make 24 of them. So far so good, i' ve eaten this regularly along the last week...but the nori is all gone so is the rice and salmon...And those cost money. So am focused of finding cheap alternatives and keep my personal satisfaction.